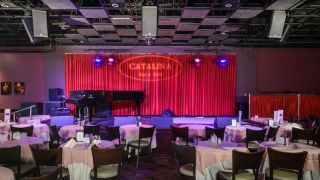 When Catalina Popescu and her late husband, Bob, launched their Catalina Bar & Grill on Easter weekend in 1987, it was with the dream of reviving the Los Angeles jazz scene by attracting international artists and nurturing local talent. In late 2017 one of those musicians returned the favor by making an introduction to QSC that resulted in a major upgrade of the venue’s sound system, which now features QSC E Series E12 12-inch, two-way passive speakers and E18SW subwoofers together with E10 passive stage monitors, all driven by PLD4.5 power amplifiers. The club’s house engineer, Jeffrey “Woody” Woodruff, provided QSC’s design team with blueprints of the room and the positions of the previously installed system. QSC recommended five of the company’s new E12 speakers—a pair hung above the left and right front corners of the stage plus one above the center—to cover the main dining section of the supper club. “This allows us to put a little extra lead vocal or lead instrument into the center, just to give a little more focus,” Woodruff said. Ever since the first night that it opened, when Dizzy Gillespie and his band attracted a crowd that reportedly included the likes of Miles Davis, Benny Carter, and Cedar Walton, the Catalina Jazz Club has made an indelible impression on the jazz music scene. Over the years, initially at its original location and then on Sunset Boulevard, where it relocated in 2003, the venue has hosted a who’s who of legendary musicians, including Art Blakey, McCoy Tyner, Chick Corea, Ray Brown, Joe Williams, Max Roach, and Carmen McRae, to name only a few.